I made a rare trip to Lidl the other day, just browsing and looking for nothing in particular. I’m not a fan of Lidl because they only stock basics and I can never get everything on my list. I loathe the weekly Food Shop and am d*****d if I’m going to go to another shop as well to buy the rest. Once, I had a list of thirteen items and could only buy two of them in Lidl!! Notwithstanding the above, they have a really good selection of non-food items, especially around Christmas and I’ve snapped up some great things in the past. Anyway, on this occasion, I spotted some T-shirts on offer. A two-pack was reduced from £5.99 to £2.99 and, in true Lidl fashion, they were only stocking men’s size 4XXXL to fit 68-70″ chest so there was a huge pile of them left unsold! I’ve fancied making my own T-shirt yarn for a while now but decided wisely that Hubby would be a bit peeved if he came home to find that I’d ‘recycled’ them without his knowledge, particularly as they are largely stain and hole free as yet. So these outsize bargains happened along at the right time and I snapped up a couple of packs. 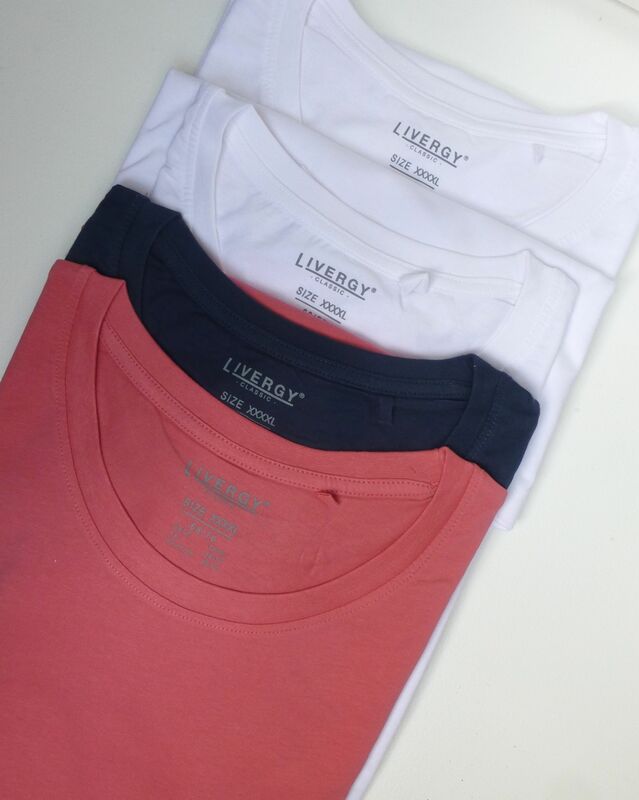 For best results, you need to choose logo-free, 100% cotton T-shirts without side seams. 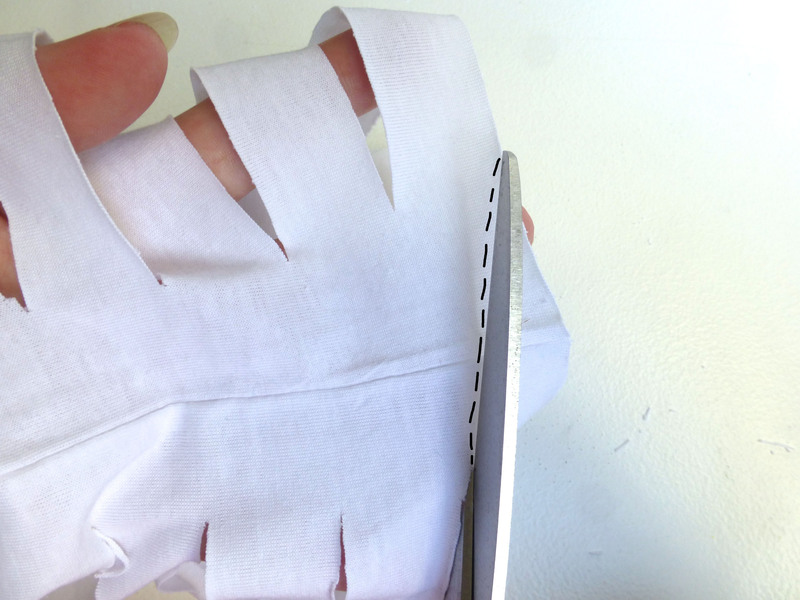 Mine had side seams – you just have to be extra careful not to rip them because they will be weakened after they have been cut through. My new Olfa cutting mat and rotary cutter were about to have their inaugural outing – how have I lived my entire life without these?! 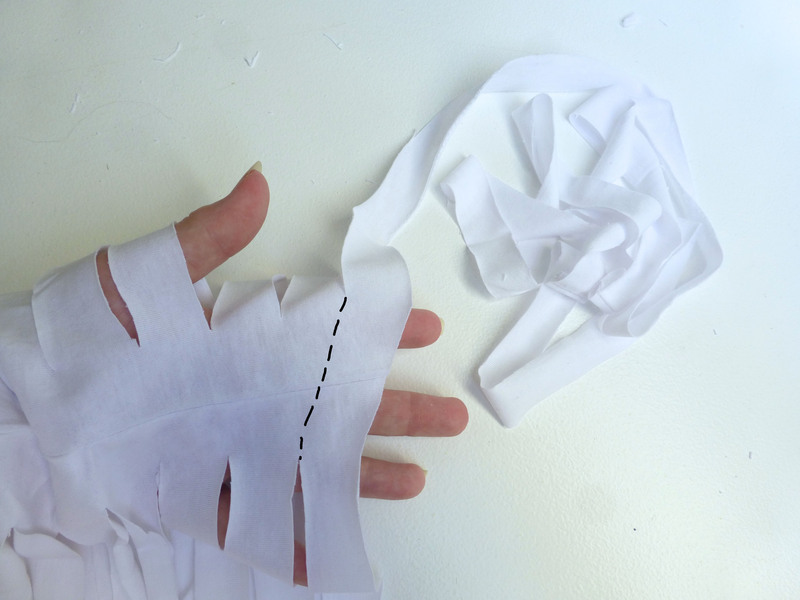 You can, of course, use scissors – it is just easier and quicker with a rotary cutter. 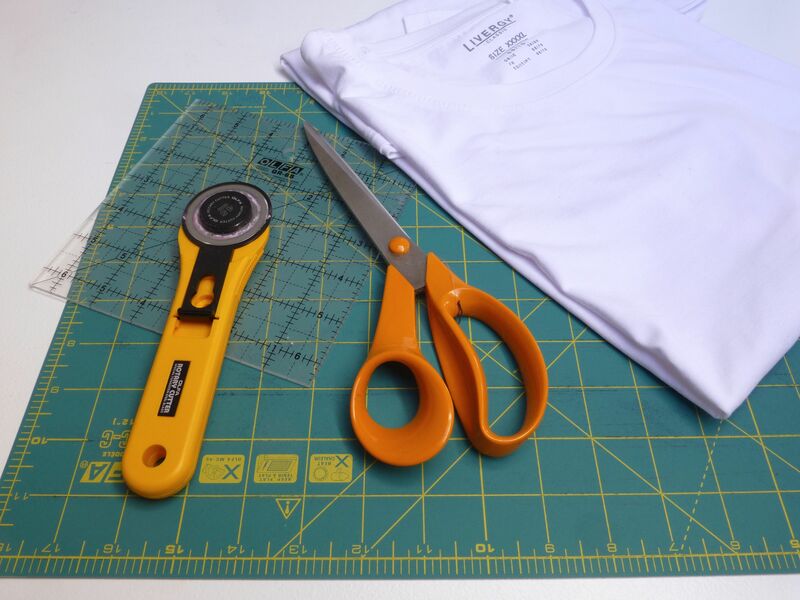 Start by cutting away the main body of the T-shirt below the armholes. 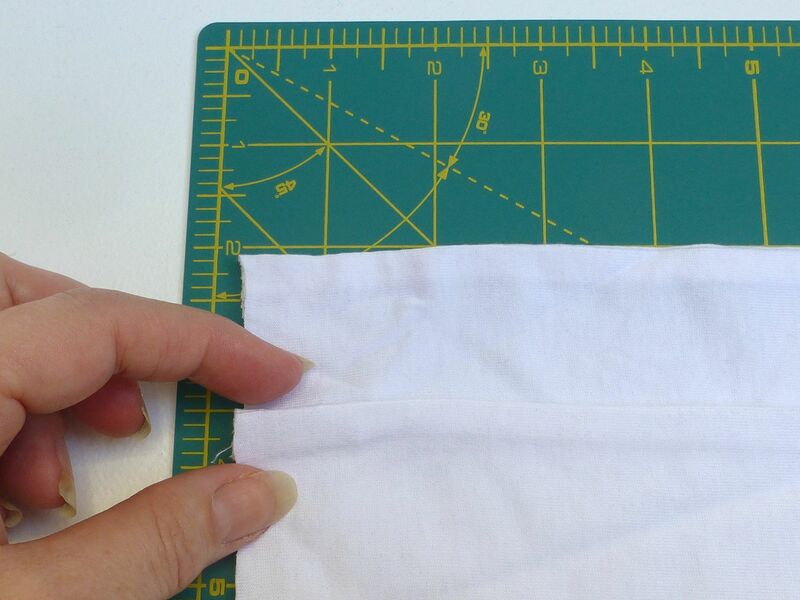 Fold together leaving about 1 1/2 inches between side seams (as shown below) and smooth out any creases. 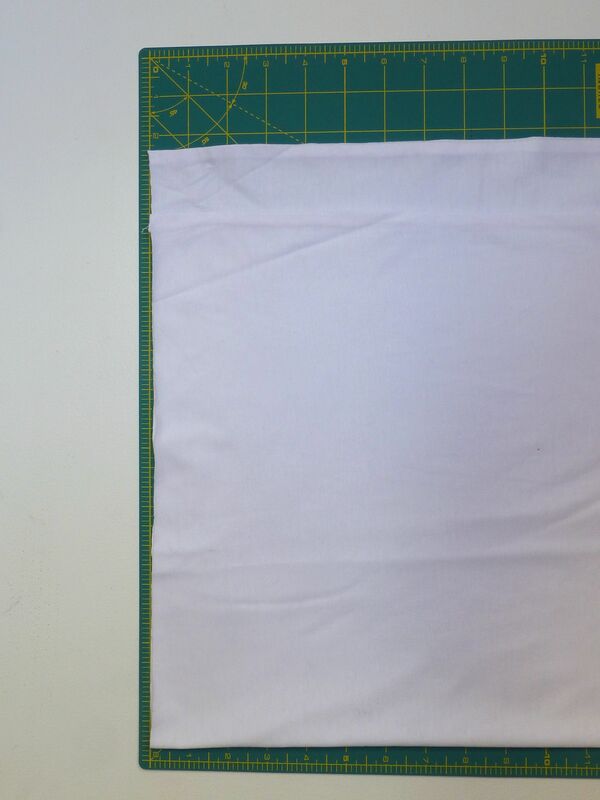 Place the cut edge to the left of your cutting mat. 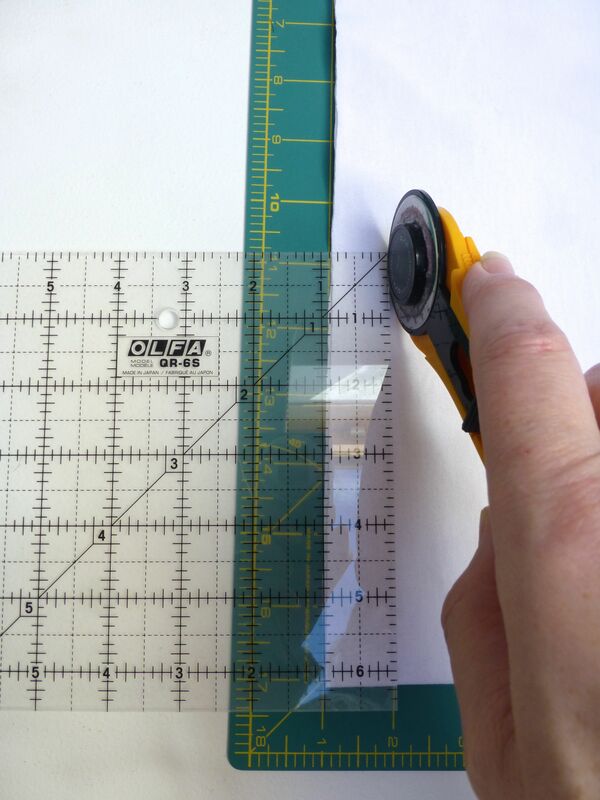 Using the quilting square as a guide, cut 1″ wide strips through all layers. 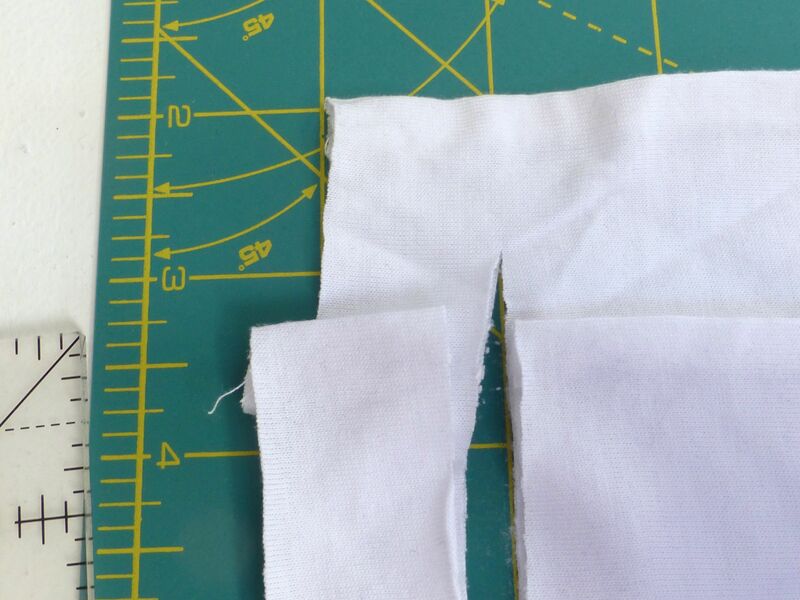 Finish cutting about an inch from the second side seam as shown below. Keep going until you reach the end of the fabric. 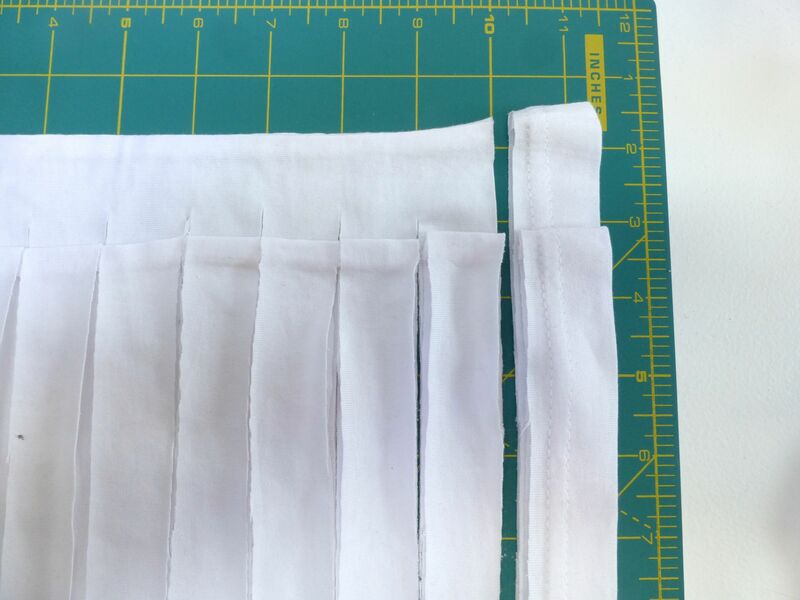 When you get to the end, trim the hem off completely. 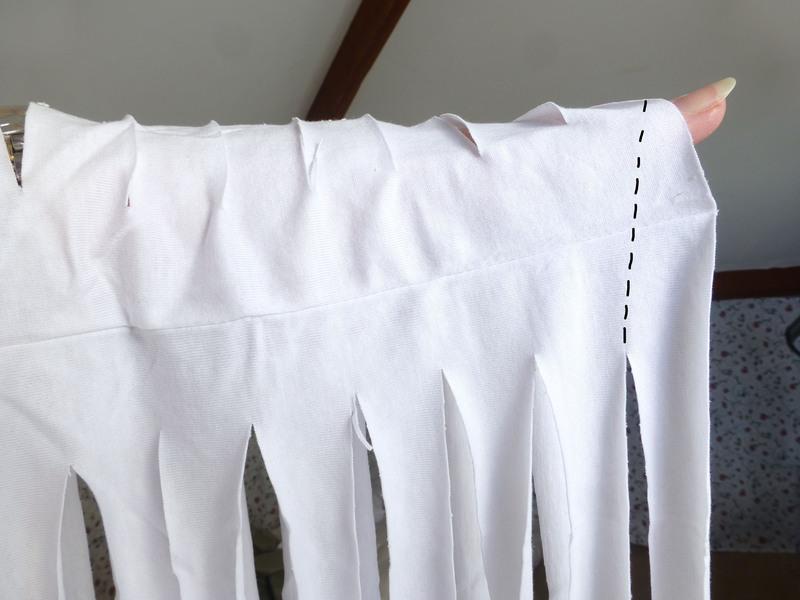 Insert your hand into the T-shirt at the uncut side seam through all the loops. Slide your hand right through to the other end and let the strips dangle. Next comes the vital bit. 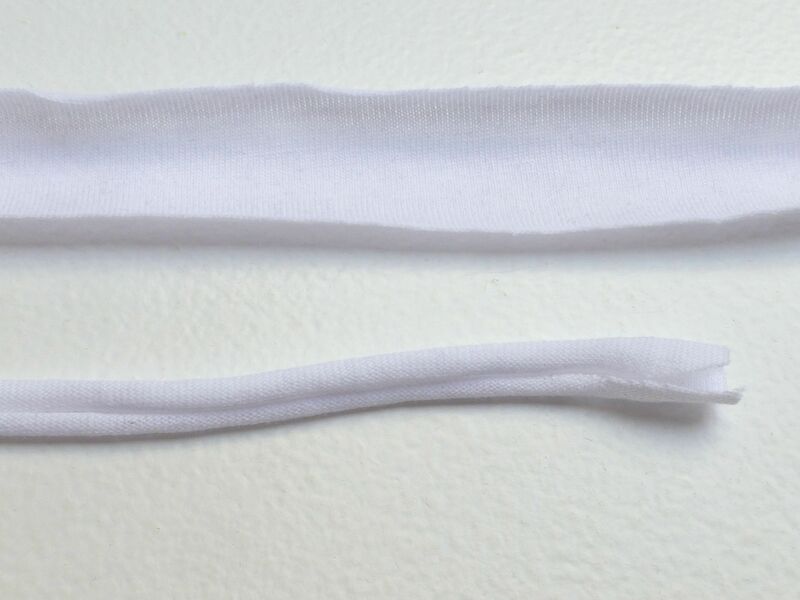 To create one continuous strip of yarn, you need to cut diagonally from your lower last slit, to the edge of the fabric as shown by the dotted line. 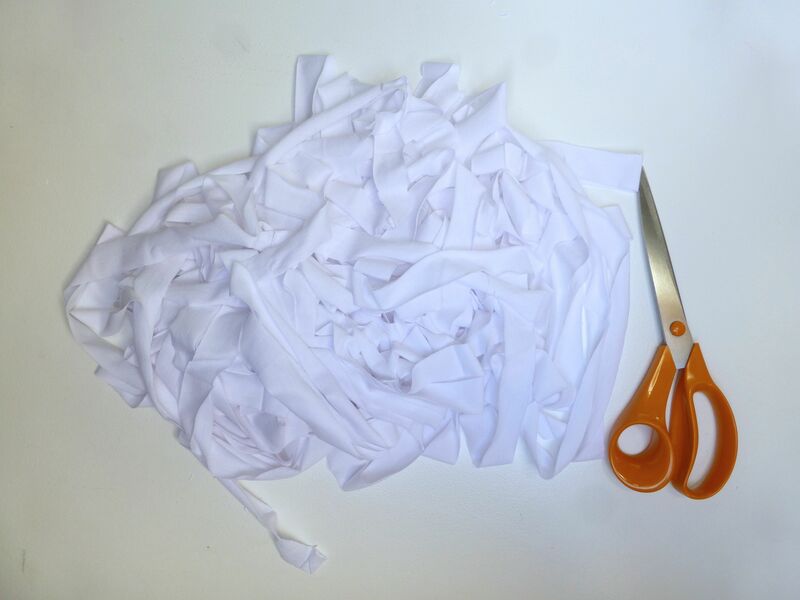 …until you have a nice pool of T-shirt strips on the table! 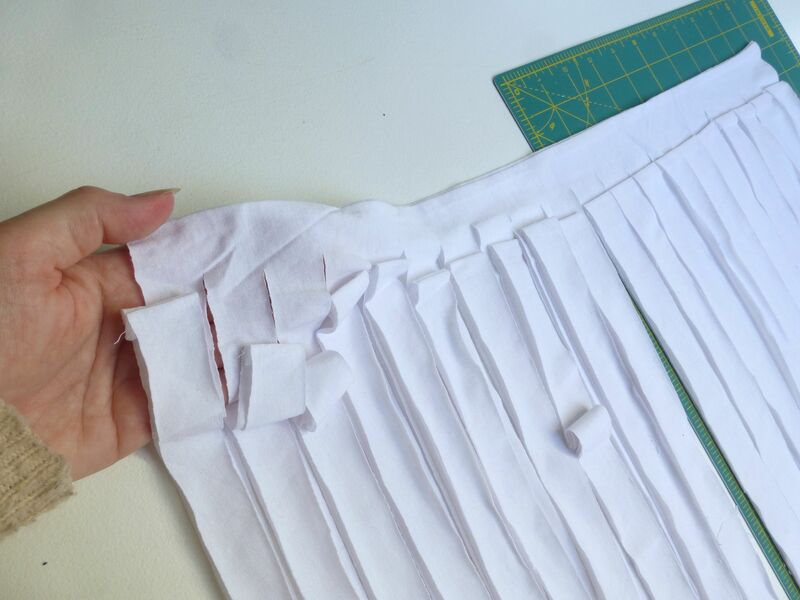 You need to stretch the strip between your fingers, holding a section and pulling it firmly until it curls, being very careful not to pull the weakened stitches apart at the seamlines. Your finished yarn will have increased in length by about 50%. 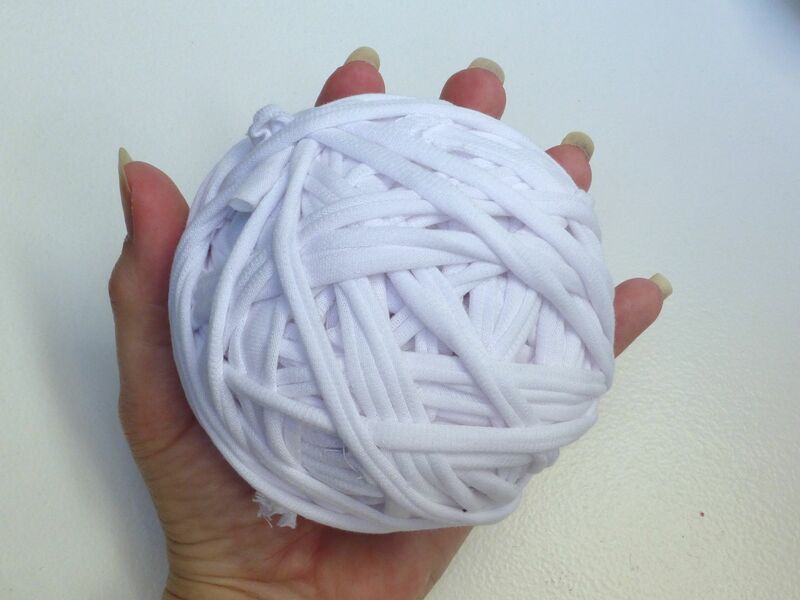 Roll your new yarn into a ball. Repeat with the other T-shirts. So now you have all this glorious new yarn, what to do with it? 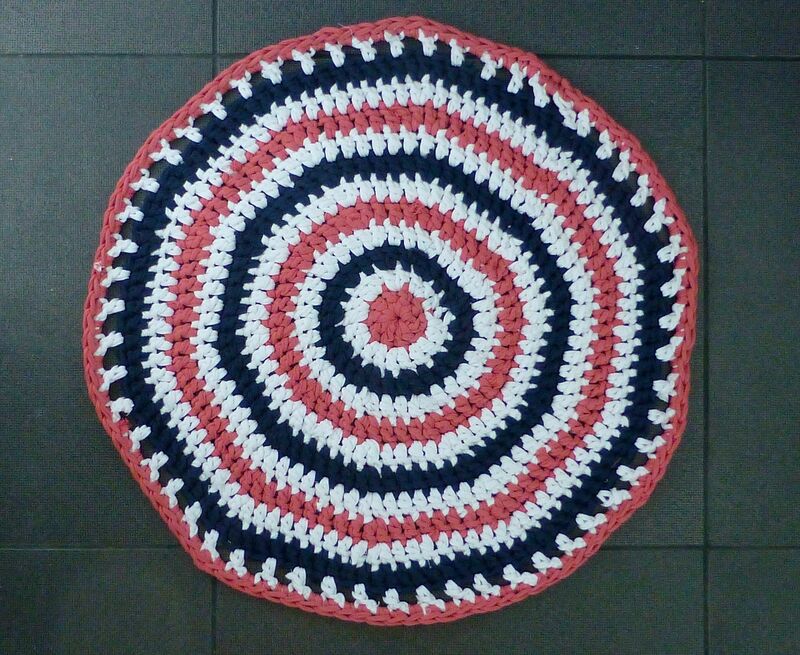 I decided to crochet a bathmat and based it on this pattern here, using fewer stitches (10) in the first round and a smaller hook (12mm). This resulted in a slightly less dense texture which I love. The rug is nice and cosy underfoot and very absorbant. 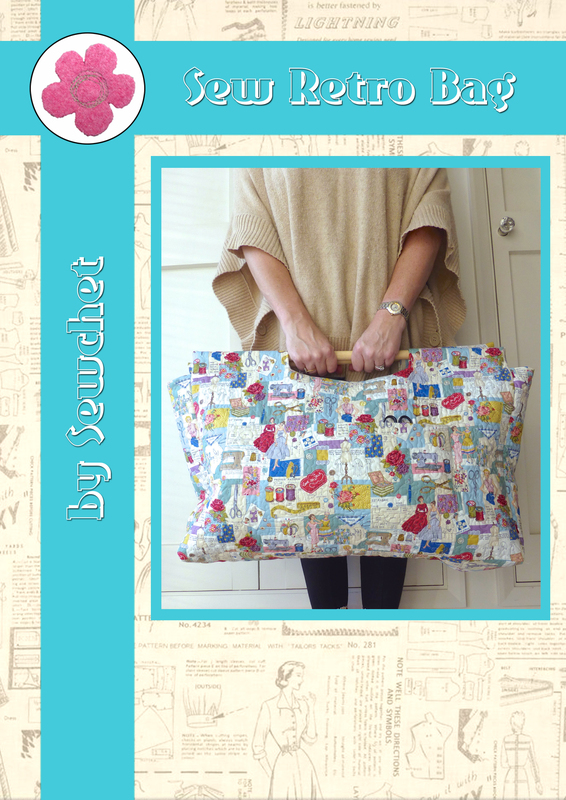 It can just be chucked in the washing machine and tumble-dried too – easy! Here’s how it looks in our bathroom. I love the splash of colour it adds. 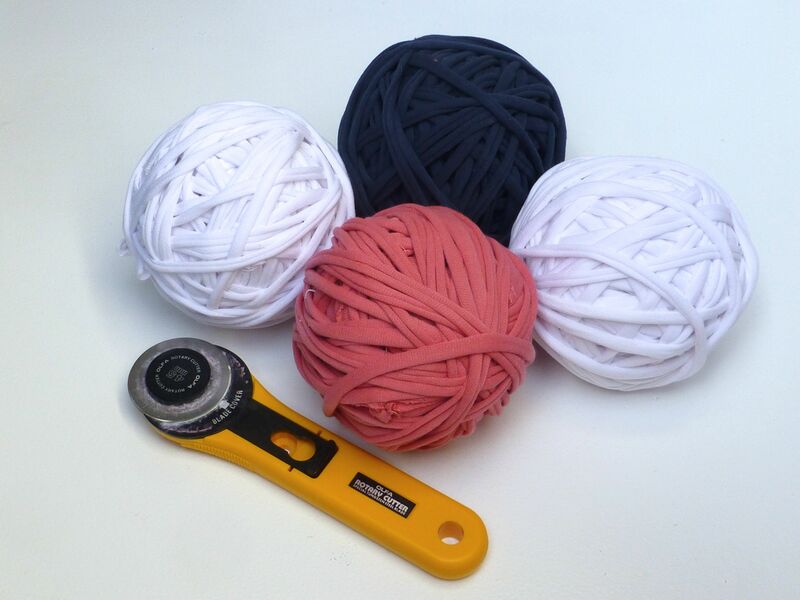 So, if you fancy having a go at making your own T-shirt yarn – what will you make with it? 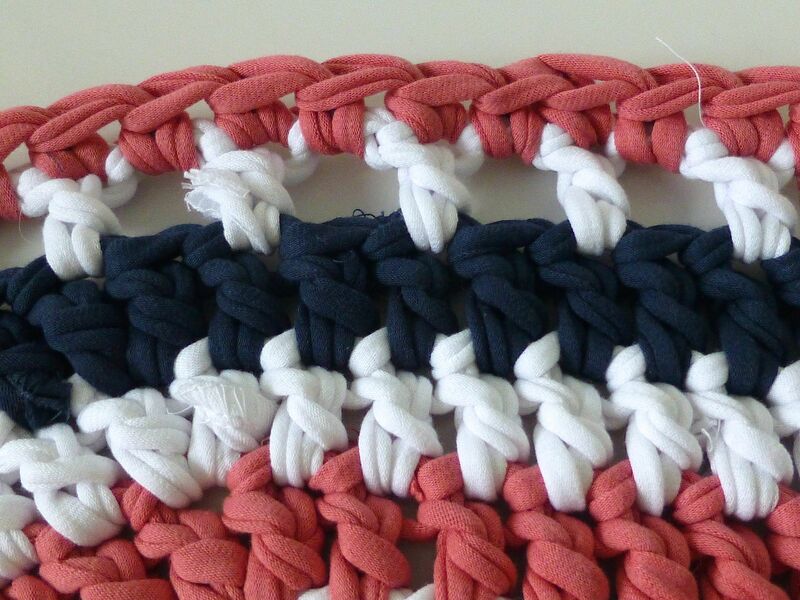 Categories: Crochet, Tutorials | Tags: bath mat, crochet, How to make T-shirt yarn, T-shirt yarn, Tutorial | Permalink. 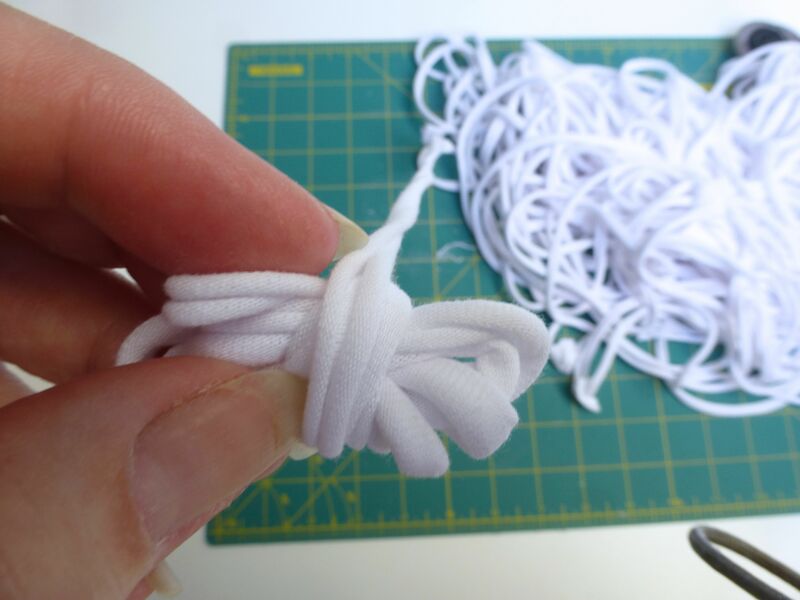 This is by far the best tutorial I have seen for making t-shirt yarn! Others have left me wondering about bits and bobs! Thank you for doing this 🙂 I may have to have a go at a rug one day too! Looks a little bit like a target – better not put it too close to the loo in case the boys are tempted….! Having raised three sons I always found that having a target improved their aim 😀 . However the bathroom floor is perhaps not the best location for said target . I have been wanting to make this yarn for awhile so thank you for this post. I have to tell you I LOVE your bathroom! Gorgeous! The rug adds a special touch to it! Thanks Teresa – I wanted to make a simple, clear tutorial as there are many out there but most are quite confusing which could put you off – it shouldn’t, because it’s very easy! What a great tutorial! 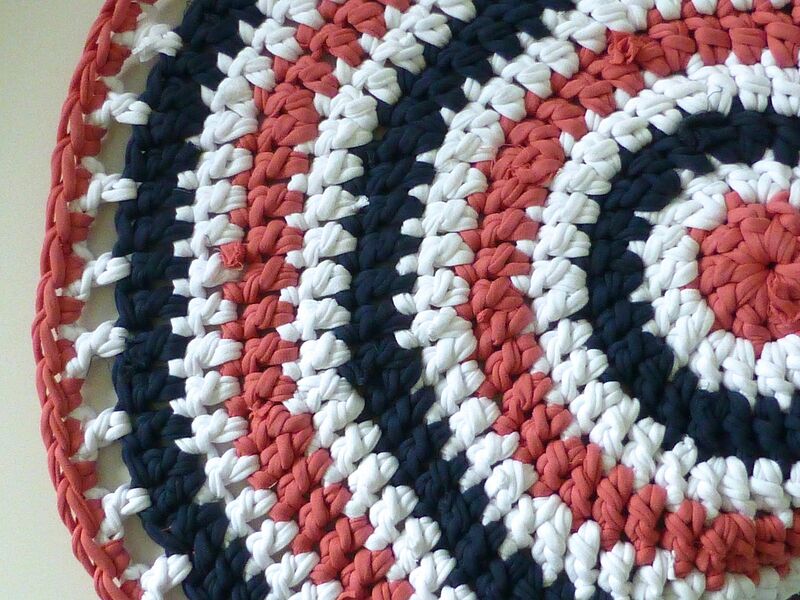 I have often thought of making a rug for my kitchen floor, but not known how many t-shirts I would need or how to proceed – and here are all my questions answered 🙂 I will now begin the task of procuring very large t-shirts! Yes, I saw I would need the equivalent of 8 large t-shirts and the biggest hook I can lay my hands on! 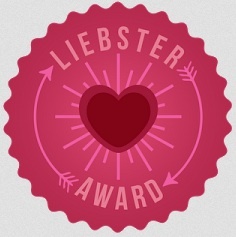 Thanks again – your post is wonderful! I cannot even begin to tell you how much I love this. That rug is fantastic! If only I could crochet. 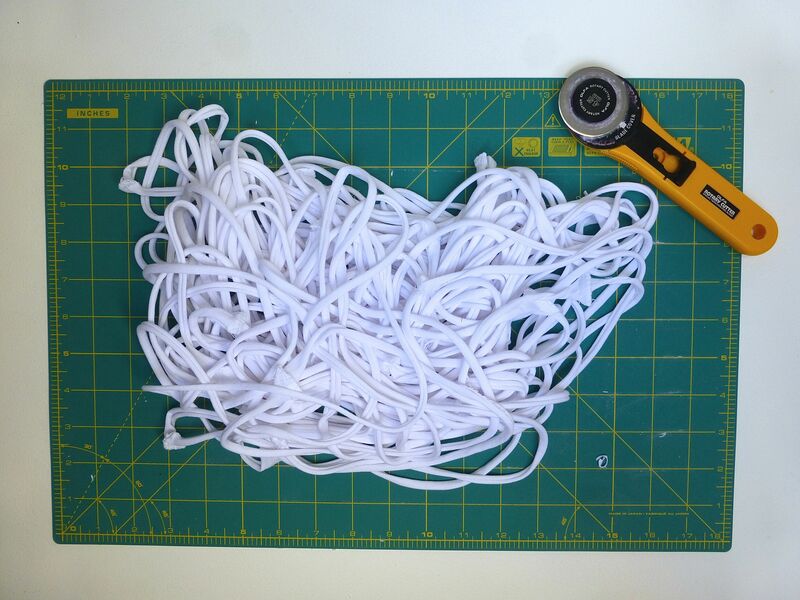 Oh and how on Earth have you survived without a rotary cutter? Even I have one! Before Christmas I only had an A3 mat but then got a nice big one and I couldn’t live without it! We had to explain to my grandma what it was though. Back in the day you used scissors or scissors! Anyway, fab tutorial and I am pinning it! So clever! Oh yes, great idea. Please do a tutorial! I’ll probably do it wrong if I have to think for myself! What a good idea! I have been tossing old t-shirts out for years. I too will be pinning so I don’t forget. The thing is with T-shirts, they look awful when they’re old and there’s not much they’re good for – except this! 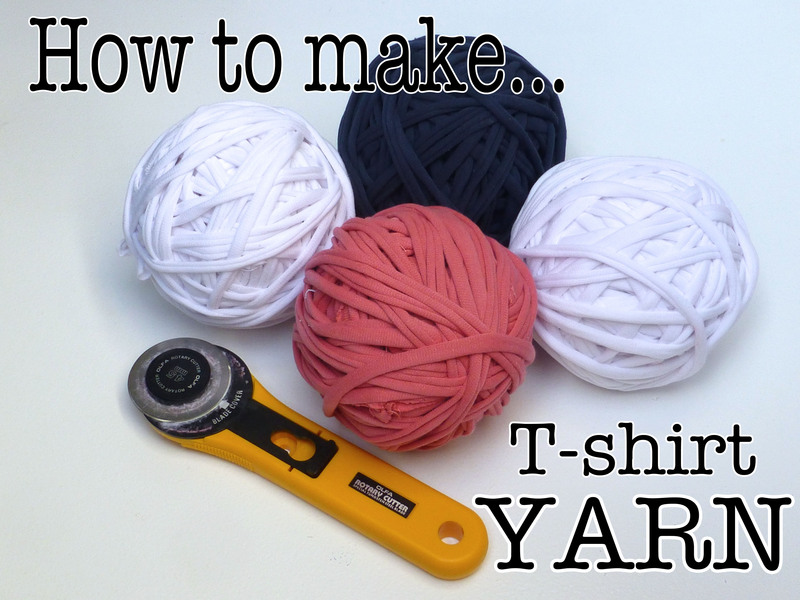 This is a brilliant post for making your own t-shirt yarn, I must pop this on Pinterest. 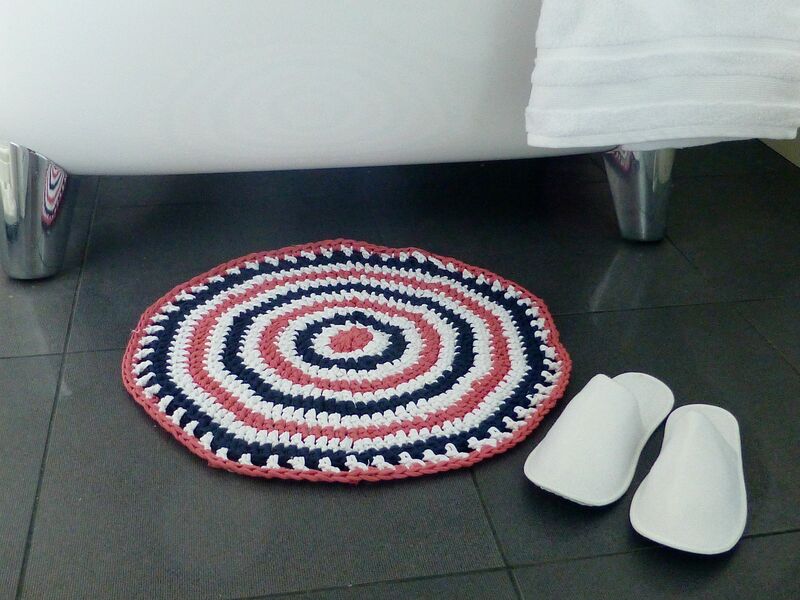 Your bath mat looks fab! Thanks for sharing. 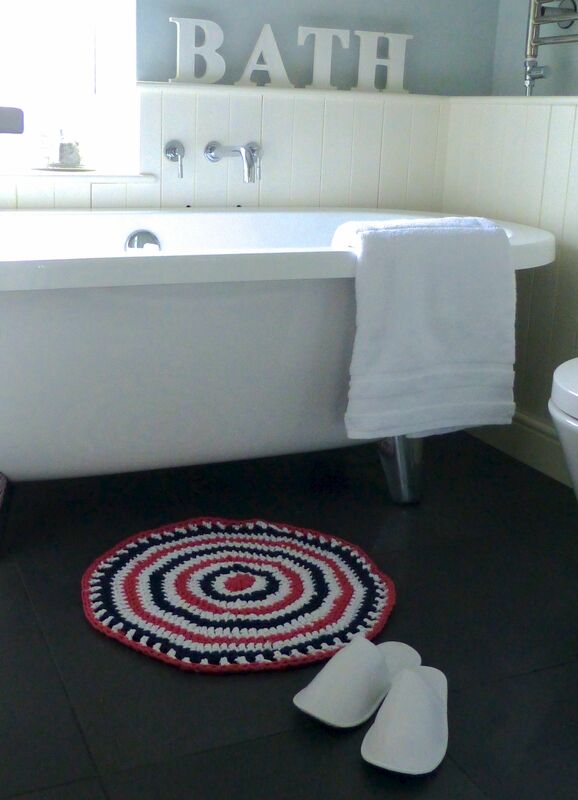 I LOVE this, the bath mat looks FAB!!! Thanks soooooooo much for the inspiration, you are a marvel – I don’t know many people who could get quite so inspired just walking into their local Lidl!!! What a fabulous idea to use cheap new T shirts! 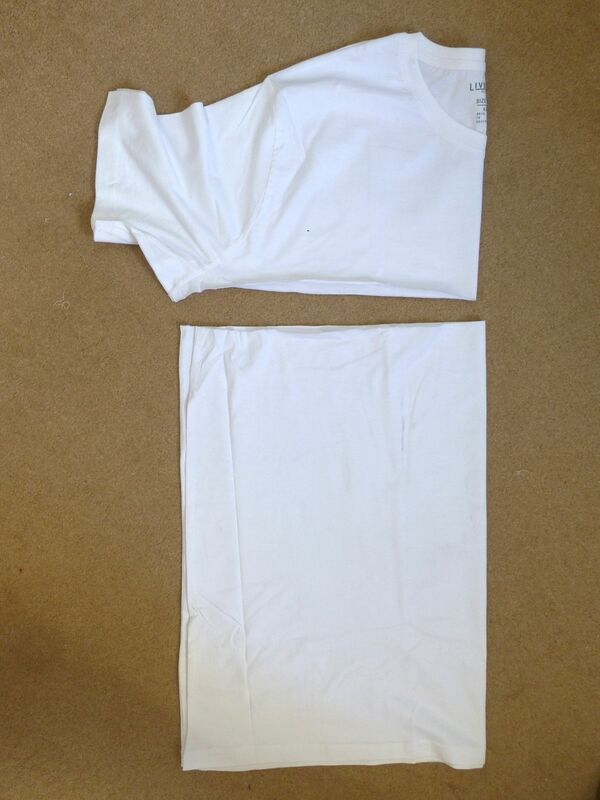 I’ve always fancied doing this but never had the discarded T shirts to cut up. And you get to choose the colours! Snap, which is why I bought these bargainous new ones. 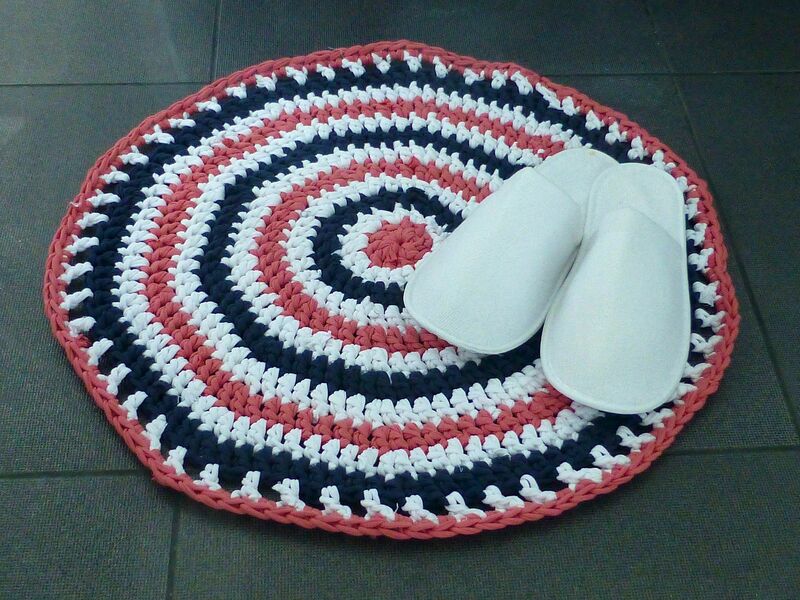 The mat reminds me of the rag rugs we used to make years ago, but much posher! I’ve always wondered how to do this – as I could never figure out in my head how to get it into one continuous string (so to speak)!! Thank you for detailing the process so well! I have a few old t-shirts that I was planning on getting rid of already, I think I may have to give this a go – we need a new bathmat anyway! Wow love it. Thanks for explaining the process so well. Love this! I need to start hunting for those XXXXL shirts now! When we get moved into our new place, you have inspired me to finally finish my rag rug! (I made fabric yarn out of an old couch slip cover that my cats ruined the corners of) Darned cats! 😉 Wonderful work, and great tutorial! Ace! 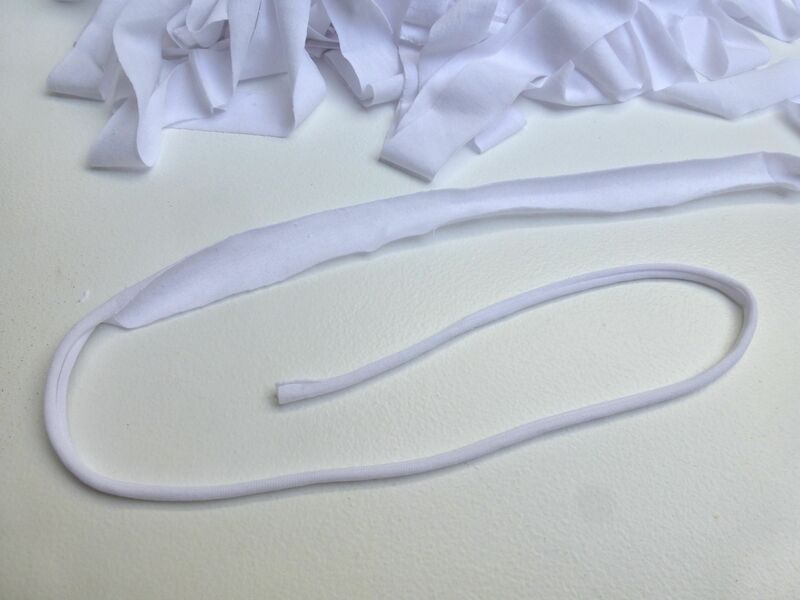 I’ve been fancying making some t shirt yarn but not got my head round the continuous thingy! Great tutorial! How many t shirts were needed for your mat? I used up almost all of the four T-shirts I bought, but they were huge! You’d probably need eight normal size ones for the same size mat. I found you via your comment on did you make that’s blog, it was the Hansons recommendation that caught my eye! I am a dorset girl! Great Tutorial!!! TARN is Fab!!! Thanks – glad it’s helpful! What a great tutorial – thanks so much! I keep seeing loads of great projects that use t-shirt yarn but just cant bring myself to buy the stuff! Wow, how fab is that?! 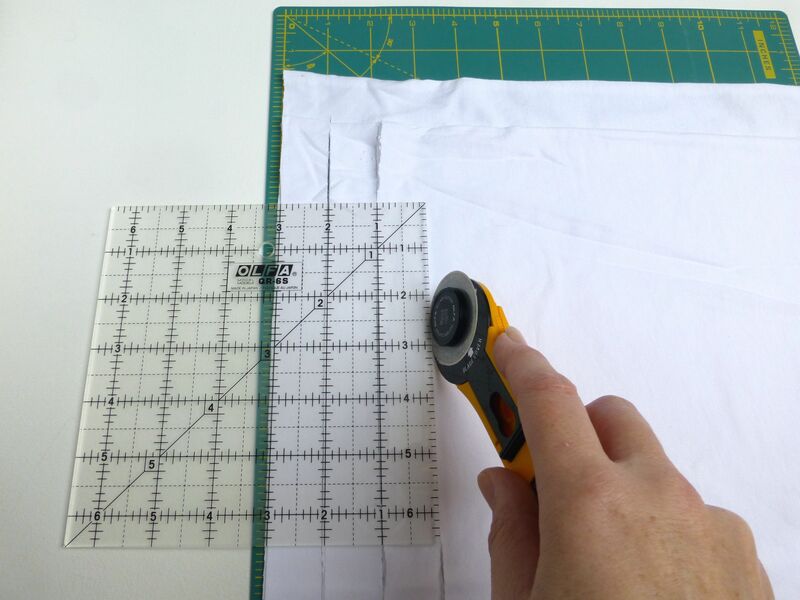 Was it easy to work with a rotary cutter on stretchy cotton? I thought it would be easier to use tailor shears instead of a rotary cutter (imagined a lot of snagging), but it was tiring on the hands! As long as the blade isn’t dull (mine was brand new) it sails through it in a flash!